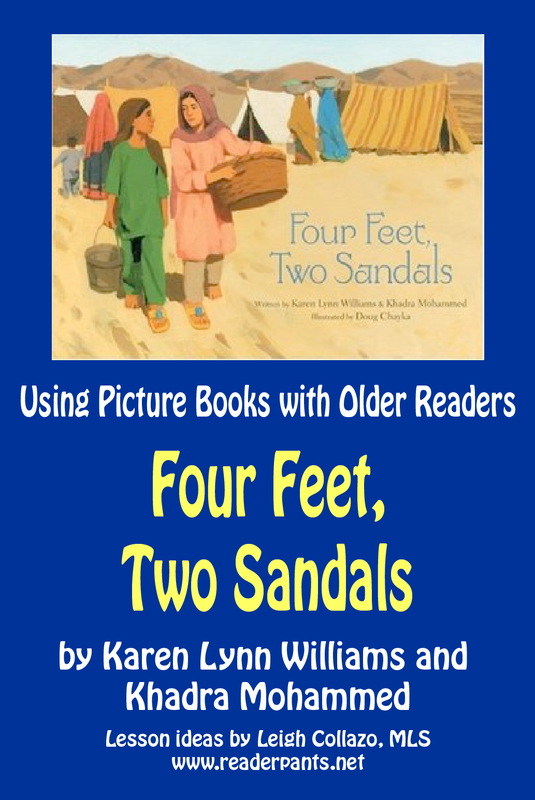 This is my fifth book in my Using Picture Books With Older Readers series. I love using picture books with secondary students! There are so many lessons in history, art, writing, sociology, psychology...pretty much every subject can be enhanced with picture books! Set in an Afghan refugee camp near Peshawar, a Pakistani city near the Afghan border. Since the early 1980s, Afghan refugees have fled to Pakistan to escape war. In this story, two girls named Lina and Feroza live in a refugee camp. When foreign aid workers bring used clothing to their camp, ten-year old Lina is thrilled to find a shoe that fits her foot perfectly. Then she sees that another girl, Feroza, got the other shoe. The girls decide that sharing the shoe is better than each girl wearing only one. 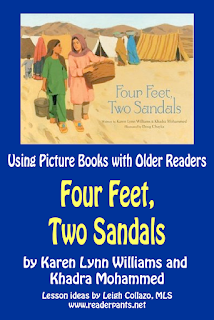 The girls become friends, going about their daily chores together and sharing the sandal. Students must understand the current world-wide refugee crisis. While this story is set in Pakistan, the poor conditions in the camp could reflect could be anywhere. In discussing the refugee crisis students need to know why the refugees are fleeing their home country and what the camp conditions are like when they get there. It would also help them to understand what the opinions of people in the host country, as well as political and economic issues the host country faces because of the refugee camps. Also, students have likely heard about refugee camps in the news, so giving them a background to the current events will help them to see that this is an ongoing issue that won't be easily solved. Students today have cameras with them a lot of the time, maybe even all the time. They snap photos in public without thinking about the people they are photographing. If we do not teach them the etiquette of snapping photos of people with their phones, who will? August 31, 2016--This LA Times article tells about recent changes in Pakistani refugee law. Afghan refugees must self-deport before December 31, 2016. If they do not, their registration cards will expire. The top of this article contains a photo of a refugee family in Peshawar. The photo features two women in burqas and eight children. Four of the children are facing the camera or partially facing the camera. The other four are either covering their faces or completely turned away from the camera. Two of the four children facing the camera appear to be girls, so gender does not appear to be a factor in whether or not the children face the camera. Why might some of them be turned away? Why might others be facing the camera? The two mothers are completely covered and turned away from the camera. How do you think they felt when the photographer took this photo? Do you think they wanted their photo taken? Do you think the photographer asked to take this picture? Why or why not? "Don't Be That Guy: Avoid Annoying Behavior By Following Basic Photography Etiquette"
This booktalk presentation is available for free download on Teachers Pay Teachers and SlideShare. In Four Feet, Two Sandals Lina and Feroza are excited to find a pair of used sandals donated by relief workers. Access to sturdy, clean shoes is a real struggle for people in refugee camps and impoverished areas around the world. Even if they are not refugees, finding appropriate shoes and socks is a continuing problem for homeless people around the world as well. "A Long Walk: Documenting Refugees in South Sudan"
Documentary-photographer Shannon Jenson talks about the water crisis in South Sudan and shows lots of photographs of the shoes the Sudanese walk miles in to get their water each day. Pair this video with Linda Sue Park's A Long Walk to Water. This is a non-profit organization founded by a formerly-homeless man. Their "sole" mission is to provide donated shoes and socks for homeless people in the Pacific Northwest. Giving back to the community with their "One Pair Purchased = One Pair Donated" campaign. Click on the link above to read about how they customize all donated socks to meet specific needs of the homeless. When I was in middle school, we had pen pals for our French class. My first pen pal was from France, a boy named Rory. The second one was a girl named Kejrudee, but her nickname was "Love." Love lived in Thailand. Though we did not correspond beyond a few letters, this was a neat experience that I remember fondly. I had a positive pen pal experience, but I'm honestly not sure if I would do this one. It's a fabulous idea, but we just live in a different world today. You would definitely want to get approval from school admin and parents before you sent any student letters to other students. Research your pen pal school well (make sure you are writing to a real school with real children) and always, always get the approval of your school and parents of your students first. I did find some sites that connect international pen pals, but if I were to do this, I would pick a school, find the librarian's email on their website, and contact the librarian directly. Sure, he or she might not respond or say no, but there are thousands of schools out there. Someone will say yes. Tip: Be sure to send the email from your school email account so they know you are legit. You can also find potential pen pal schools by posting your request on LM_Net (lots of international librarians on there!) or by joining FaceBook groups like Int'l School Library Connection. This is a really sweet site that contains several letters from tweens welcoming kids their age to Minnesota. If you have a refugee community in your area, this would be a really great way to make those children feel welcome and safe. In this situation, I would visit the refugee community organizers personally to ensure the people we are sending letters to are actually children. I looked very hard online to find an international refugee camp pen pal program. I did find a couple of organizations--RESPECT and the United Nations Refugee Council (UNHCR)--but neither of their websites were particularly helpful. RESPECT's website is far too outdated; the most recent post I could find was from 2012. The UNHCR does not specifically list any pen pal information, but it appears they have connected pen pals with schools in the past. Possibly an email to the UNHCR might net better results. If you or someone you know is part of either of these organizations or another one that connects student pen pals, please let me know! International Pen Friends--This site is for written letters, not e-email correspondence. e-Pals--Use this site if you are looking to connect with a school for email pen pals. No major ideas on this one, but this short BBC News video about the Olympic Refugee Tema is incredibly inspiring. Pair this with Warren St. John's Outcasts United. Looking to order more books about the refugee experience? Check out author Mitali Perkins' booklist, divided by age group.